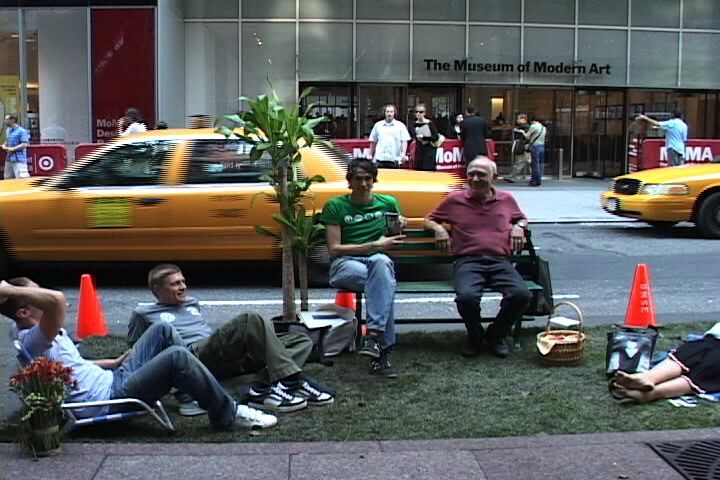 Update: Park(ing) Day 2008 is fast approaching and here in NYC you can apply for a mini-grant to get your parking spot up and running. This year’s Park(ing) Day is doubling in size – with 50 spots coming to the streets of the 5 boroughs. Make sure your neighborhood isn’t left out of the fun! For more info, you can check out www.parkingdaynyc.org. National PARK(ing) Day was a huge hit here in NYC where Transportation Alternatives & The Trust for Public Land organized a of group of motley advocates in liberating parking spaces to open green areas for city residents to enjoy. Last year, NYC had just one spot, but this year nearly two dozen were sponsored across the city - ranging from a mini-gym on Bedford Avenue in Brooklyn to a tribal village (complete with tee pee!) on Manhattan's West Side. Most amazing was the overwhelmingly positive response the event received. Residents, tourists, commuters, and drivers (yes drivers!) were seen voicing approval. Peds relished the chance to take a seat or diddle their feet in fresh sod. Some ate pizza. Yum! Posted in Public Space. Tagged as 2007, colin beavan, Livable Streets, Parking, Parking Day, parking space, Paul Steely White, Quality of Life, Rebar, street theater, Transportation Alternatives, Trust for Public Land. Excellent video! Captures what Park(ing) Day was all about much better than the video coverage by NY Times, NY1, etc. Great job Clarence and Transporation Alternatives! More space to the people! Great job Clarence, TPL, TA and all the other groups that put this together! Yes, this was much better than that truly awful New York Times video. Amazing video of an amazing day, Clarence. We want cities for people not cars! see how much more footage you can get when the filmmakers are on bikes? 😉 here's to the no-impact camera crew! Loved this. Thanks for sharing these mini-parks with maxi-punch. This is as good a StreetFilm ever gets! This guy needs an Academy Award created for his work, I could watch this over and over. What a terrific idea! We were part of a busload from PA visiting NYC yesterday and saw WHY the need for traffic alternatives is critical. Best wishes for continuing succes. Wow, thanks for all the early comments! Keep them coming...I've had so many personal emails telling me this is their favorite StreetFilm. I'm happy about that. I believe this city could be transformed if enough people see this. As always, Clarence makes something look simple and casual what is a ton of work. To get around all those places spread throughout the city, and then to edit this and get it out so fast.. its amazing. The video highlights the need to concentrate on supporting local initiatives. As Eugene Hutz would say, Support Local, F--K Global. Political solutions rarely work and even when they do are often temporary. Focusing on public education, outreach to all boroughs, direct action, street theatre of this type, all help create a groundswell of opinion. And if we can get enough people to act like this, then we just take back what is ours. Politicians just follow opinion: its up to the people to show them the way, not just by casting a vote every four years, but by taking daily action as demonstrated beautifully in this video. Thanks Steve. I got around alot for sure, even on sprained ankle, but Nick shot all the Brooklyn locations and Dan shot the Bronx and Upper Manhattan. So props there too. And we were ALL on bike. More parks, less car (parking)! Clarence, the work of streetfilms and streetsblog does help contribute to a changing attitude and perception, and will indeed help change nyc. Park(ing) day happened up here in Northampton, MA, and here is some video of the event, along with all the links I could find to actions across the nation. This was an awesome job! Well done to everyone who took part in Park(ing) Day. Also, I thank you on behalf of the Lower Eastside Girls Club. We think this film turned out to absolutely great. PARK(ing) Day was so much fun - I wish I could have visited more sites! Thanks to LES Girls Club for awesome smoothies, BirdBath Bakery and Time's Up for yummy lemonade and treats, TPL for the grass (shout out to the people I worked with at MoMA and Times Sq. ), XDesign of NYU and Prof. Natalie for a bit of micro-scale ecology, Lindsey at TA for coordinating everything.... and of course, Clarence for putting it all on video! I wonder how many of those people who thought this was a wonderful idea actually owned a car. I bet a lot of them, especially the ones out in Brooklyn. It's a great idea, and yeah, parking spaces do need to be priced higher. A beautiful video of this wonderful initiative, and I very much hope a prelude to vision42 - a landscaped, auto-free light rail boulevard on 42nd Street. Now this is UnReasonable! I love it. I wonder if your fed the meter for a year if they would let you take two lanes? PLEASE post this on YOU-TUBE so that LOTS MORE people see it: imagine what it might spawn! You lift my heart...and it's been dragging way too much these days. Thanks you so. I think that's a curious idea but funny and maybe you can change something in the future. You have really shown a great idea buddy..
You make your ideas well but I still am not sure yet. How about the parking day 2010? Does NYC still do this anymore? I can't find anything on it? I wanted to share something I found to be fantastic. I was searching for NYC parking and found a new application called CityMaps and it is a one stop shop website. Made finding parking a breeze. !awesome!, good example for reply in Bogotá, Colombia!! Canada Goose Parka jackets come with multi pockets designed that make the jackets very practical for wearing when for outdoor activities. All the Canada Goose Trillium clearances are with good crafts made that would be comfortable for wearing. Filled goose down can ensure people on the Canada Goose Expedition warmer and more windproof.